Rystad Energy estimates that E&P companies paid ~1.9 trillion USD globally to governments during 2013. This represents ~50% of the total revenues generated from the E&P industry. In 2013 governments experienced the effects of lower oil prices and higher costs levels. In total, cash flow to the government was down 5% in 2013 compared to 2012. Among the non-OPEC countries, Russia and United States are the two countries with highest tax collection from the E&P industry with 180 and 135 BUSD, respectively. Norway was the fifth largest country with a total income of 67 BUSD. 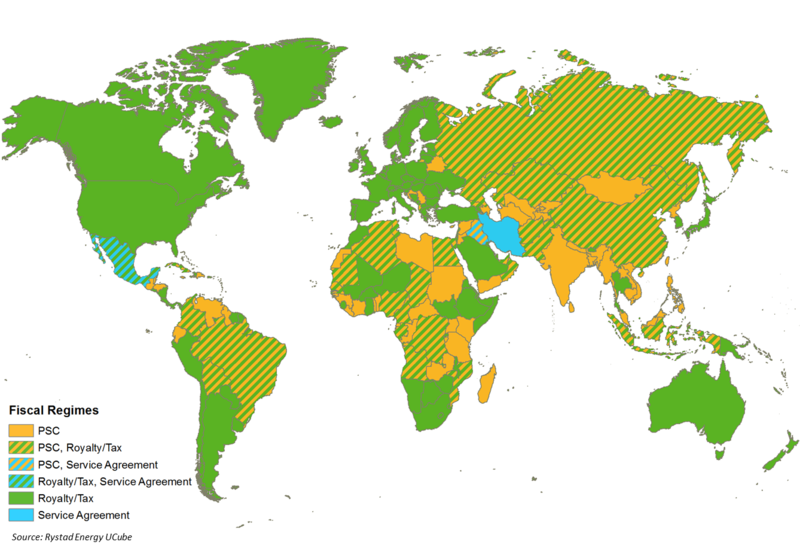 The map above indicates the oil and gas fiscal regimes for each country. There are three main fiscal regime types: profit sharing contracts (PSC), royalty/tax, and service agreements. Among the OSCE countries the standard regime is royalty/tax (also referred to as Concession), while PSC contracts are more common in Africa, Asia and South America. Iran, Iraq and Mexico are among the few countries with service agreements.